This section is provided as a set of guidelines for the restoration of vintage woodworking machinery. This section is solely intended for mechanical operation and cosmetic accuracy. There is no intent to provide any information on safety for these machines, nor is there any instruction given as to the safe use of the machines. 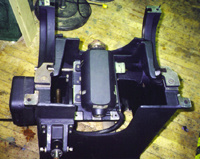 It is not implied that restoration will make any machine suitable for safe operation. The author assumes no liability, written, implied or otherwise for any of the following information or responsibility for results achieved as a result of the following information. Special thanks to Dave Pollak from Creative Woodcraft in Dover, NJ. Dave's insightful writing on machine restoration in Dana Batory's book on Vintage Woodworking Machinery served as the guideline for this section and provided many of the tips you will read below. 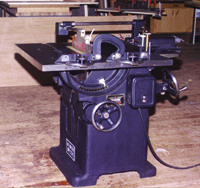 Vintage Woodworking Machinery by Dana Batory is available from Astragal Press. Before you buy any machine, you should spend a good deal of time familiarizing yourself with the going rate of such a machine. Once you have done your price research, you are better armed to make a good deal for yourself. Remember, negotiation is 80% preparation and 20% negotiation. Once the machine is found and before you buy it, there should be some routine checks performed. Following is a checklist of things to look for when purchasing used machines. 1. Ask the owner of the machine how it runs and if they maintained it. When possible, run it yourself. 2. If you are able to see the machine running, close your eyes, put a hand on the machine, and listen and feel for anything that might indicate a problem such as vibration, squeals, or other odd noises. Remember that old machines were made with much more cast iron than modern machines. Cast iron absorbs vibration, so if something is vibrating or shaking, something is wrong. 3. It is also necessary to check the phase and voltage of a machine. Many old industrial machines ran on high voltage (440 and up) and were 3 or even 2 phase. The replacement of a motor can be very costly, so check this out first. If the motor needs to be replaced, this should be part of your consideration of value. 4. With the machine disconnected from its source of electricity, grab the arbor or spindle that does the cutting and pull it laterally. There should be no play in these parts. If there is, there is a bearing problem or some other wear problem. 5. To further check for runout, it is best to bring a dial indicator with a magnetic base. Set the indicator and run the probe just against the arbor, spindle, or cutterhead while turning it by hand. If there is more than .005" runout on table saws, shapers, jointers, and planers, this could start to give a less than perfect cut. Sanding type machines can sustain larger degrees of runout as they are cutting with abrasives and generally running at lower speeds. Generally, .010-.015 is acceptable for disc sanders and spindle sanders. These problems are usually bearing problems and should be negotiated from the price if all other things are in generally good condition. Remember that the bearings could be bad even if there is no runout. Usually, bearings that exhibit a large degree of noise will generally need replacing. One good way to hear a bad bearing is, with the machine running, to bring a large screwdriver and place the driver end on the casting where the bearing is held. Put the other end of the screwdriver up to your ear and listen. This haphazard stethoscope will allow you hear a bad, improperly lubricated, or dirty bearing. Even better is to obtain a stethoscope from a doctor friend and listen to the bearings that way. After you hear a few bearings, you will easily tell the difference between a bad bearing and one that runs smoothly. Once again, you have the best chance of negotiating a good deal if you have shopped around, seen a few machines and understand the general pricing structure. 6. Bring a flashlight to check the undersides and insides of machines. Dust off the sawdust and pitch and look for and cracks in the castings or missing parts. 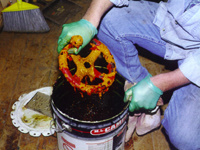 Look for signs of lubrication, and signs that would suggest that lubrication was leaking from the machine. 7. Obvious site inspection will determine if there are rusted parts and how bad the rust is. Surface rust can be sanded and treated with naval jelly to virtually remove it. Signs of deeper pits from rust may suggest that a certain part or parts will need to be surface ground or Blanchard ground. 8. Bring a straight edge to check the cast iron tables for warpage or twisting. 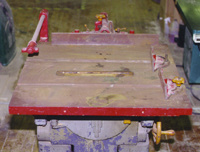 On some machines, warped tables are completely unacceptable such as jointers and planers. Slight warpage will not affect most table saw operations, and even moderate warpage will not usually affect most disc or spindle sander operations. However, warpage that must be corrected can usually be done for little money at a Blanchard grinder. The only thing to look out for is if there are number or angle graduations etched into the top of the tables. These would be virtually lost in any type of grinding operations. Sources are provided for grinding in the Sources section. 9. If possible, it is best to obtain some information from the machine maker. If the company is no longer in business, there are usually other collectors around that can provide you with a complete manual or even some photos. Once you have obtained a manual or some other information about the machine you are about to buy, you can now determine which, if any, parts are missing from the machine. Missing parts are another way to negotiate a better price for a machine. I will not buy the machine if too many parts are missing unless it's a "can't walk away deal". A source for old manuals is provided in the Sources section. 10. When possible, it is always helpful to know where the machine was used while it was in service. For example, machines that were used in production operations, or even worse, in saw mills, will generally have seen more abuse than a comparable machine that was used exclusively by a patternmaker, or even a school. School machines tend to have the lowest hours of usage, even though they tend to sustain a bit more abuse by misuse. 11. Remember one last thing about buying used equipment. In most cases, you will get the electricals, dust hook ups, and many times, knives, blades, or cutters for that machine. These items will generally be given as part of the deal, making a better deal for the buyer. Peripheral parts are another thing to take into consideration when negotiating price. Old machines can be found in many different places. Other woodworking companies, auctions, want ads, newspapers, antique stores, the Internet, schools, or any other association that brings woodworkers together. Occasionally, a woodworking company will buy a lot of an auction that will contain one item they want, and several that they don't. They will then sell off the undesirables, which may be very desirable to someone else. Once a machine is acquired, its time to start assessing what is going to be needed to get the machine back into perfect working order. The first step I take is to make a list of missing parts or handles. Many comparable parts are available from several national suppliers, which I provide in the Source section. Additionally, many machine makers are still in business producing parts, if the part is not available from the machine maker, or from a catalogue, the next step is to determine approximately what the part looked like and have one custom made by a machinist. In the case of the Oliver 232 table saw shown in this article, the saw was acquired for free from a local closed school, so there was no debate on whether to take it. There was however, a list made of missing parts. In this case, two pins that locate the rip fence on the table, one knob that locks the rip fence to the table, one knob that locks the rack and pinion gear that moves the fence in and out, and one knob that locks the fence in the set place. The pins were obtained directly from Oliver, the table-locking knob and the rack and pinion locking knob were available from a supplier, and the fence-locking knob was custom made. The assessment of missing parts is always the first step to restoration because the parts will be ordered and on their way to you while you are working on the machine. Based on the initial check process, if it is determined that there is a problem with the machine's, motor or bearings, now is the time to investigate further. If the motor does not run, it is best to replace it or repair it at this time. With a working motor, it can be determined what other parts need work. You can determine bearing problems, vibrations, and other needs when the machine is running. If the bearings need replacement, there are several sources for purchasing new bearings. You can undertake the bearing replacement yourself because the motor will dismantle in the same logical fashion that the rest of the machine does. Or you can take it to a machine or motor shop. Other vibrations will be cured by re-tightening all bolts and fasteners on the machine when the machine is re-assembled after restoration. The next step is to completely dismantle the machine. For this process it is important to stop and observe the area being dismantled before attempting to take it apart. While studying the assembly sequence, it is also a good idea to take some close up photos of the area being worked on. Particularly if the area contains many small parts that have an obvious order in which they need to be disassembled and re-assembled. This will greatly help the process of re-assembly allowing you to see exactly how everything was originally put together. A little bit of time here will save a lot of time later. It is strongly recommended that photos be taken and accurately labeled during disassembly. Remember that there will be many small pins and screws involved in the dismantling of a machine. Many times these pins and screws will be hidden by sawdust that has accumulated in them over the years. It is therefore very important to look carefully at the way the machine was assembled. If a particular area of the machine does not want to come apart easily, chances are that there is a pin or set screw holding it, that may be hidden. Before using force to take it apart, check it fully. When it was built, the machine went together in a logical production sequence. It will come apart easily if the reverse sequence is used. Be patient during this process and remember that the pieces should slide apart and back together easily, especially when they are clean and oiled. If parts are stuck or screws won't loosen easily, it's a good idea to use a commercial rust dissolver like Liquid Wrench or Kroil. If the parts are completely soaked and left overnight, they should be loose the next day. It is also possible to loosen parts with the application of heat, but this is only in severe instances. This machine was exposed to water damage and was rusted in every area. The table top was severely rusted but did not contain pits. The paint on the saw was completely peeling and the undercoating was also peeling. The surfaces such as the top which do not require painting can be most efficiently reconditioned by sanding with 220 grit abrasives on a random orbital sander. Here the left side of the table is free from rust and the right side is being sanded. Once the initial rust is removed, I then sand with 320 and 400 grit. Then a coat of naval jelly is applied to remove any other rust and to give the surface a new appearance. To finish it off, I rub the whole top with steel wool and past wax . It is necessary to completely clean the parts and remove the paint prior to painting and re-assembly. The first step is to label the dismantled parts, by grouping them to a specific area of the machine, in small, labeled boxes, or coffee cans. When the parts are grouped, you can then set about stripping each set of parts. The stripping process is most easily accomplished by setting up a five-gallon bucket filled with about three gallons of lacquer thinner. Most small to medium sized parts will fit into a coffee can which can then be completely submerged in the thinner bucket. This will also help to keep the parts organized. Larger parts do not need top go into coffee cans. It is recommended to leave the machine parts immersed in the lacquer thinner for at least 24 hours. The longer the parts stay in the thinner, the easier the layers of old paint will be removed. After the parts have had 24 hours in the solvent, they can be removed and brushed with a fine copper or brass brush. Be sure that the brush is not steel as it could damage some of the fine threads on screws and such. Make sure to wear thick solvent resistant gloves and goggles for this process as thinner will splash. It is helpful to dip the brush into the thinner to take off any remaining bits of paint. Once the parts are fee from all paint, they can be dried, blown off with compressed air, and placed back into their labeled boxes. The next step is to prepare the major large parts for paint. These parts do not need to be completely stripped of their paint, however, some work is recommended. The first step is to remove any loose paint. This may be done by hand, or with a stripping machine that goes on the end of a hand held drill. You can also use a rotary wire brush in a drill. This item may be purchased from your local paint store. After the loose paint is removed, the next step is to wipe the castings down with lacquer thinner and let dry. Once all parts are dry, the painting process can begin. The cleaning of the parts is perhaps the most important step in insuring that your machine will go back together with ease and operate smoothly. All surfaces that have been machined need to be cleaned thoroughly. A machined surface is any surface that is flat and smooth and does not have the "rough" surface texture of the other cast areas. Any part that mates with another part will be machined. These machined areas can be easily cleaned and brought back to their original condition by using an abrasive rubber block. 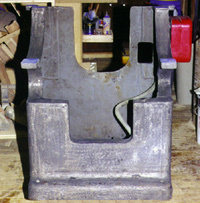 The abrasive block is silicone carbide grit suspended in a hard rubber block. As the block wears, it is constantly exposing new abrasive surfaces. These blocks can also be cut with a razor and shaped to fit odd areas in the castings. They are available in several grits. The surface should be finished with the finest grit block. (See Sources area) The cleaned machined areas should not be painted. They must be carefully masked off before painting. The masking should be accomplished with removable masking tape and paper. It is easiest to tape off large areas, rub the tape down hard, and then cut back the unwanted portion with a sharp "Exacto" knife or scalpel. This will leave a sharp delineation where the paint will stay. 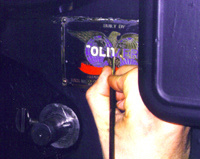 One of the most important areas in my opinion is the manufacturer's nameplate indicating the model, serial number and place of manufacture. Although this plate has no bearing on the performance of the machine, and restoration is strictly optional, many of these old logos are very attractive and give the machine its vintage feeling. These plates should be treated with the utmost care in the cleaning and restoration. Usually, the plate will not be removable as they were riveted on and removal would cause damage to the plate. The nameplate should be carefully cleaned. Any missing paint within the logo can be hand painted back in and then any raised areas can be polished with the fine abrasive block. Once the plate is cleaned and painted, it should be coated with clear lacquer to preserve its appearance. Usually, I like to try to find out what the original paint color was on the machine the day it was produced. This is often possible by looking at the underside of a machine where someone may have missed when they were applying a new coat color of their choice. If the machine was painted thoroughly, and no old color can be seen, then the best way is to try to see what the last color was that came off during the stripping process. Many of the old machines used dark colors such as gray, green, graphite, or black. When the old color is determined, you can go hunting at the paint store for something close. A paint that is formulated for use on metal in industrial applications is best. Spray cans work best and are convenient and dry fast. However, if you choose to match the original color exactly, you can bring a small chip of the paint to the paint store and have them mix up a color. This will obviously be a brushed on color or put into a cup gun as opposed to aerosol spray, but the choice is yours. It's best to give the machine three coats of heavy paint to offer it strong protection from chipping and rust. After the entire machine has been cleaned and painted, the masking tape can be removed. Be careful to get all of the tape off. Sometime when the tape is painted, it's hard to detect. Once the tape is all off, I usually take all of the major machine parts and begin to reassemble. Anywhere there are two parts touching should get well oiled. It will make the machine go together easier and function more smoothly. When the large parts are together, you can begin to assemble the smaller components. This is where the photos taken before disassembly come in very handy. You will be glad you shot them. Be sure to oil all of the screws before putting any of them into their holes, and oil all machine ways and gears. Anywhere metal touches metal should have oil. Also make sure that the grease fittings are packed with clean new grease. After the entire machine is painted and reassembled, I will do the final steps of the restoration which is the hand painting on the nameplates. 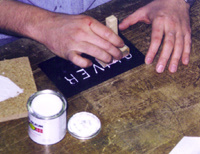 In this case I have made a rubber stamp out of soft rubber about 3/16" thick to use as a blotter to apply paint to raised letter areas. This restoration work on the nameplates is my favorite part of the process. This is a place to take your time. Neat work here will make the machine look great and a machine that looks good, will be treated with respect by the people who use it. This is a detailed look at the finished Oliver nameplate and blade tilting scale, before the handle for raising the blade is put back in place. Handles, knobs, machine screws, etc.